There is a lot to consider when first learning how to go backpacking. It’s an amazing hobby and one that can add a lot to your life. Being immersed in nature evokes a certain set of primal instincts. This is deeply satisfying. Yet, you have to prepare as nature can be harsh and unforgiving. When you are hiking for more than one day, you face a different set of challenges to a typical day hike. Today, we’re giving you our best backpacking tips for beginners to help you overcome those challenges, and enjoy a comfortable time in the wild. The most important decision you’ll have to make when planning your backpacking trip is where to go. There are many factors to consider here which this backpacking guide will help you to navigate. As a beginner you’ll want to choose something that isn’t going to be too demanding. The first factor to consider is the route. Look for flat trails that are short and don’t have too much elevation. It will take a few trips before you begin to understand your own physical limitations. Much better to underestimate those to begin with! If any problems do arise, it is always safer to be near civilization. That doesn’t mean you can’t enjoy the wilderness, but try to pick a route that isn’t too far away from some roads or small towns. The most popular beginner backpacking trails tend to have plenty of people on them. That means you are never far away from another person, should problems arise. Finally, if you are camping out overnight start with just a single night. Even the most prepared beginners will encounter some surprises on their first few trips. Most minor problems aren’t usually that serious when you are only staying for one night. If you suddenly realize you didn’t pack enough food, you can usually tough it out for one night. Where possible, choose an established campsite for your early expeditions. Aside from being much easier to find, it will also likely have some facilities that simplify the experience. A good example of this would be bear-proof food storage boxes or bear poles. If you’re new to this, then it saves you having to figure out the hanging food back trick. 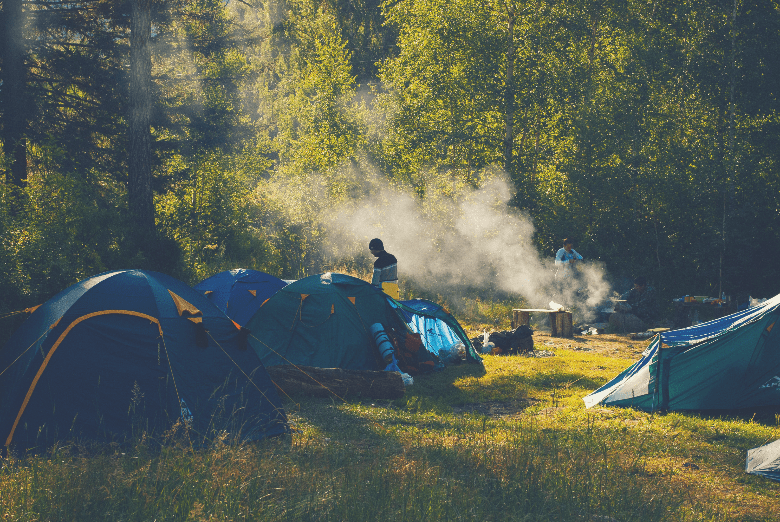 Again, established campsites are more likely to have other people there. This adds and extra layer of safety since help is never far away. Try to research the campsite online or in a local guidebook beforehand. Campsites with a dirt flooring are much easier to pitche you tend on than any kind of wooden platform. This saves you having to hammer in your tent pegs. Access to fresh water is always crucial at any campsite. Besides the whole essential to your survival thing, water is also useful to clean and cooking equipment. Some more established campsites will have pre-built fire pits which are safe places to get some heat or heat up some toasted marshmallows. One of my favorite parts of backpacking is sitting around a fire at the end of a long day’s hike. There is something magical about watching a fire. The last thing you want is for the fire to get out of control, so fire pits are you friend here. Conditions can vary dramatically even over short distances. Always research the local conditions when you are planning a trip. This includes checking local laws about fires, litter and wildlife. Certain areas may have specific dangers such as bears. You must take special precautions must here. It’s also worth checking the expected weather conditions. This will help you to plan what to pack as well as avoiding starting any forest fires by accident! Planning your first trip is exciting. It’s easy to get carried away and invite your entire extended family. Just be careful with less able bodies individual. This includes the elderly as well as children. Until you have some experience, it’s best not to bring kids. You may find yourself in some challenging situations that isn’t going to made easier in the presence of your children. Learn to take care of yourself first, then by all means bring your kids on a later trip. The same goes for pets. Don’t bring your dog along if it’s your first hike. There are extra things to consider here, especially for small dogs. They may tire out and need to be carried or they may cause extra problems with local wildlife. Either way, you don’t want to run into problems like this as a beginner. Part of being prepared is making sure you have the right equipment. As I discovered on a recent trip to Australia, backpacking is no fun when you don’t have the right equipment. I had rented a flimsy tent and stove, complete with a few missing pieces. Make sure you invest in some high quality, reliable gear before you go. Make sure that whatever overnight backpack you bring is comfortable. It sounds obvious but the vast majority of people don’t check this. Load up the pack with some weight and try walking around in it. Is it comfortable? Does it sit right on your body? Test it out before you buy or borrow. You may be tempted with an ultralight backpack. Less to carry, right? The thing is, ultralight backpacks have much less padding and can be quite uncomfortable when fully loaded. If you want to save weight, do that on the things that go inside the backpack. In terms of size, that will really depend on how long your trip is. If you followed my advice in the planning section and just opted for a one night trip, a 30 liter pack should suffice. However, for 2-3 night trips, you’ll probably want a 50 liter pack. If you are buying one, I’d recommend this size as you’ll probably start going on longer trips once you build up some more experience. Extended trips of 5 or more days usually require 70 liters or more, but that’s probably overkills for beginners and even intermediates. The one exception here would be if you do plan on taking your kids along in future. No, you won’t fit them inside the pack, before you ask, but you’ll have to carry extra food and clothing for them. Sharing is caring. It’s also much more efficient to share a two-person tent that for two people to bring two one-person tents. When choosing a tent, save yourself some weight and pick up a three season tent. You don’t need a heavier one rated for harsh winter weather yet – Mt Everest can wait till next year! One thing you probably won’t want to share is a sleeping bag. There are generally two types of material: Down and Synthetic. Down is lightweight and great in the cold, but can be much more expensive. Synthetic sleeping bags are quick-drying and better in wet environments. As they are cheaper, it’s usually a safe place to start. As with tents, you can probably skip the winter rated sleeping bag. Sleeping pads have two functions: comfort and insulation. If you can sleep on a hard surface, a closed-cell pad can save a lot of weight and money. However self-inflating pads offer a better nights sleep for not too much more. This was the first upgrade I purchased after my first backpack camping trip. You’ll want to start with a reliable stove. Nothing recharges your body and your mind in the wilderness like a hot meal. Gas canister stover are the easiest option to start with. As stoves are usually metal, make sure to pick a lightweight one. Some stoves these days come with USB ports and all manner of fancy contraptions. For a beginner, keep it simple. Make sure that your gas canister is full enough before you set out on your trip. Many people bring pots and pans from home. But you can usually pick up some lightweight variety from your local camping store. Bring just enough so you can cook and eat your planned meals. One set of cutlery is enough, you can wash it each time. Just make sure to bring some biodegradable soap to do so. If you bring a small towel, you can hang it outside your backpack during the day so it can dry. If you are camping near a good water source, then simply bringing a couple of plastic bottles might be enough. Water bags with long tubes can be handy for a drink while on the go. Just remember that if it’s easily accessible, you’ll probably drink a lot more quickly. You’ll definitely want to drink more water than normal on any backpacking trip. If you don’t want to splurge for a water filter, some simple purification tablets can make almost any water drinkable. Unless you know it’s safe, be sure to filter or purify your water. You never know what bacteria could be in the water otherwise. Insulation – When the weather is cooler, insulation keeps you warm. Think of all those hiking fleeces that soccer moms wear. Rainwear – A waterproof outer layer is essential. You never know when the weather could turn. For your first trip, you will probably have much of this clothing already at home. By layering your clothes, you can really adapt quickly to weather as well as keeping yourself dry. Just make sure to avoid cotton and denim which takes a very long time to dry, should you get wet. Perhaps the most important item of clothing is your shoes. 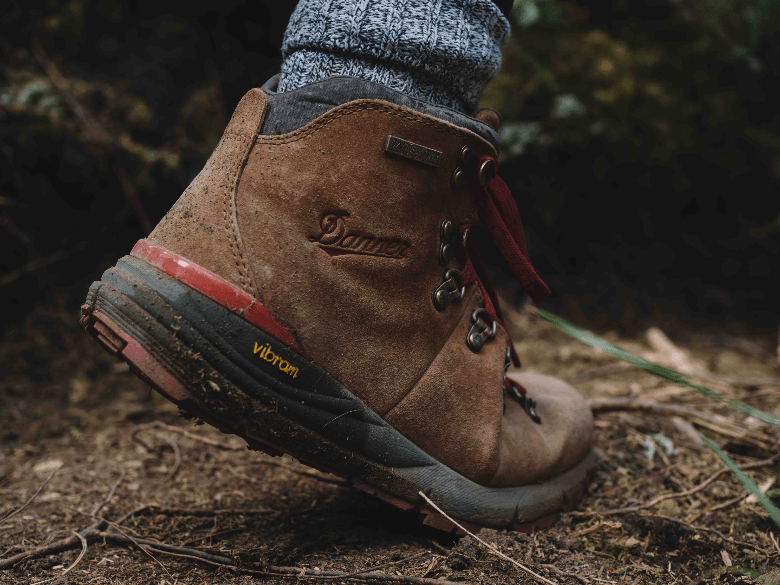 There is an endless debate about wearing proper hiking boots or more lightweight trail runners. Hiking boots are strong, sturdy though take a while to ‘break in’. I’ve had many blisters from wearing these without breaking them in properly. Trail runners are much more lightweight, almost like sports trainers. They are breathable and keep your feet cool in hot weather. Best of all they require no ‘beark in’ period. One downside is the lack of ankle protection. If you are carrying a heavy pack, this can be a little more risky. Check out our backpacking checklist. Be sure to run through it before you set off to your adventure. Walking long distances carrying a heavy backpack is physically demanding. You’ll want to make sure you have plenty of energy to keep going. Make sure you eat plenty of calories while on your trip. Complex carbohydrates are the best source of energy here. While it’s great to have a hot meal at night, and even sometimes in the morning, just remember that cooking and cleaning is a lot of extra work. Fresh food won’t last too long without refrigeration too, remember. Simple breakfast bars or granola are an easy way to start the day. Hot instant tea of coffee can get some warmth into you and get you ready for a day’s hike. If you want to spend the time to cook, bacon and eggs is a good choice (bring a cooler bag) or even pancakes if you are feeling adventurous. Some people enjoy a full meal at lunch time, whereas others prefer to have large snacks throughout the day. The later option tends to be better for maintaining a stable amount of energy. It’s best to take food that doesn’t require cooking for lunch. Energy bars, dried fruit, nuts are great choices. Peanut butter & jelly sandwiches can be great for shorter 2-3 day trips. I like to take some chocolate too, as it always lifts my mood. Dinner should be a large hot meal. Having something to look forward to will help you find the energy to keep going. The go-to meal of choice would be some kind of boil-in-the-bag meal. You can get almost any dish done like this these days, though often with varying quality. Rice, noodle or pasta dishes usually have a lot of nice complex carbs. Canned tuna keeps well on longer hikes can add some nice protein to the mix. Drink plenty of water on your trip. It’s important to stay hydrated as you’ll be sweating a lot throughout the day, especially if the weather is hot. Tea & coffee can provide a nice warm drink if it’s colder. I’d generally avoid drinking any alcohol for obvious reasons. Soda can be heavy to carry and it is difficult to keep cool, so consider going without for a few days. Part of preparing for any backpacking trip is learning the skills you need to survive as well as training yourself for the physical challenge. GPS is great, but it can and does fail. Batteries can lose charge, devices can get damaged. Don’t leave home without a good old fashioned map and compass. It’s incredibly important to know where you are and which way you are going. Watch this video to learn how to do just that. Walking for hours every day, several days in a row, carrying a heavy backpack is tough. You don’t have the comforts of home to recharge yourself at the end of the day either. You need to have at least a modest level of fitness. The best way to train is by going on smaller day hikes, carrying a pack. This will get you used to walking long distances and carrying a pack. The last thing you want at the end of a long day’s hiking is to discover that you’re missing a piece of your tent or that your stove doesn’t work. Take all your equipment out at home and test every piece to make sure it works. This goes for clothing too. As you do this, make sure that everything is fully dried out. Nobody likes a wet sleeping bag. Weather can and does change rapidly. Check the forecast before you go. If it’s going to be heavy rain, consider postponing your trip. Everything is harder in the rain, especially for beginners. Even if there is no rain forecast, bring waterproofs. Conditions can change quickly. Make a route plan before you go and give it to friends or family members. Set a check-in point at the end so they can contact help if you go missing. Bring a first aid kit to help with any minor medical problems. Be aware that cellphone signal may not reach all parts of your journey, don’t count on this in case of emergencies, though calling 911 (112 internationally) may work even if you have no cellphone signal, as these calls can use other networks too. Planning and preparation is everything. Choose a manageable route for your experience level. Research and choose the necessary equipment for all weather conditions. Make sure to test it thoroughly before you go. Bring good nourishing food & drink to keep your energy levels high. Make sure to prepare yourself physically and mentally.